The LaRue County High School boys’ basketball team defeated Trigg County 76-48 to claim the championship game of the Kentucky Machine and Engineering Christmas Classic at Trigg County Dec. 23. Junior forward Bryan Bault recorded a double-double with 17 points, 11 rebounds, two assists and one steal to lead the Hawks (9-0) to the win. Senior forward Tyler Hornback chipped in with 17 points, nine rebounds and four assists, while freshman forward Kyle Sheeran added 10 points, four steals and two assists. Despite missing 20 free throws, the homestanding LaRue County Lady Hawks still found a way to win their third straight game Dec. 9. The Lady Hawks were 14-of-34 from the free-throw line, but used a 22-point third quarter to pull away from Fort Knox and went on to a 59-35 win. LaRue County (3-1) stretched an 11-point halftime lead to a 29-point advantage at the end of the third quarter over the winless Lady Eagles (0-3). Sophomore guards and twin sisters Lyndsay and Valerie Whitlock combined for 31 points as the visiting Lady Hawks (4-2, 1-1 18th District) rolled past the Lady Colonels, 62-34 Dec. 19. It was Caverna’s sixth loss in as many games. For much of the game, the Lady Colonels Caverna’s roster consisted of three freshmen, an eighth-grader and a sixth-grader. For the Lady Hawks, Valerie Whitlock led the way with 16 points, six rebounds, four steals and one assist, while Lyndsay Whitlock had 15 points, six rebounds, two assists and two steals. Senior forward Tyler Hornback scored 21 points, senior guard Christian Seymour added 15 and the visiting LaRue County Hawks won their fourth consecutive game with a 67-58 win over 5th Region rival Washington County Dec. 17, a game that was delayed a day due to wintry weather. Hornback also had four rebounds and one assist, while Seymour added two rebounds, two assists and one steal. LaRue County got a jump on the boys’ basketball season Dec. 6 with a 69-65 win over Harrison County in the Campbellsville Tip-Off Classic. Harrison County jumped out early on LaRue, capitalizing on several transition layups. The Hawks kept pace with their opponents with a collection of three-point baskets by freshman Kyle Sheeran and junior Christian Mullins. Sheeran knocked down four 3-pointers in the first half, while Mullins cashed in on a couple of baskets from the corner. 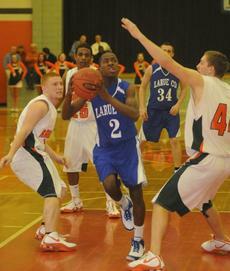 At the end of the first half, Harrison led LaRue 38-33. 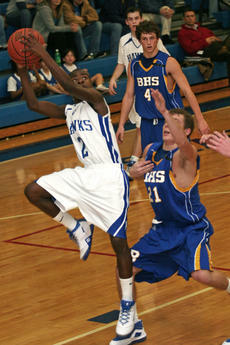 Three Hawks scored 20 or more points to lead homestanding LaRue County (2-0) past 5th Region rival Bardstown Bethlehem, 89-72, on Dec. 9. Freshman guard Anthony “Smurf” Brewer got the Hawks on the board early while Tyler Hornback added nine quick points in the first quarter. The Eagles matched the Hawks basket for basket, as neither team could extend a lead on the other. The second quarter proved similar as each team took turns with offensive runs. The Ryle Raider Rumble always has been a tough wrestling tournament, but this year exceeded expectations in terms of difficulty. LaRue County’s young Mat Hawks didn’t respond as well as their head coach, Gary Canter, had hoped. For more information, call 358-9949. Head wrestling coach Gary Canter wasn’t sure what he would get from his young Mat Hawk squad heading into Oldham County Saturday. Canter would have been happy to finish with a 3-2 record, but at the end of the day the Mat Hawks were in the finals match with fifth-ranked Seneca. The team lost the match by one point. 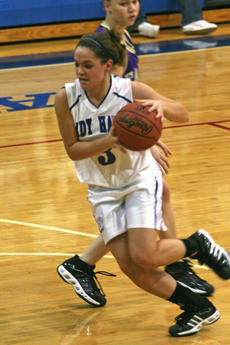 The LaRue County High School Lady Hawks won their first game with a 48-26 bashing of Campbellsville’s Lady Eagles Dec. 5. The homestanding Lady Hawks held the Lady Eagles scoreless in the second quarter en route to their first win of the season. Lyndsay Whitlock led LaRue County with 16 points, nine rebounds and one steal, while Valerie Whitlock added 12 points, eight steals and five rebounds. Freshman guard Nancy Howell chipped in with nine points and three rebounds.